W I L D B L O O M : collected remnants. >> catching fire movie ticket stub. i sat on the back row with my popcorn, root beer, and sour gummy worms. it was the best. >> ibc root beer cap. i'm not a pop drinker (soda for you northerners), but a root beer once in a blue moon is nice. >> instax of penguin inflatable. we put out the inflatables over the weekend. a snowman, penguin, and rudolph. >> hershey's candy cane kiss wrapper. my church hosted a banquet last night, and it was surprisingly not boring. >> price tag from totter the penguin. i casually mentioned how cute the new stuffed penguin on the pier one commercial was. my mama surprised me with one the next day. she's the best, y'all. >> leaf from a photo shoot. i took a family friend's senior pictures at the football field yesterday. so many memories there. 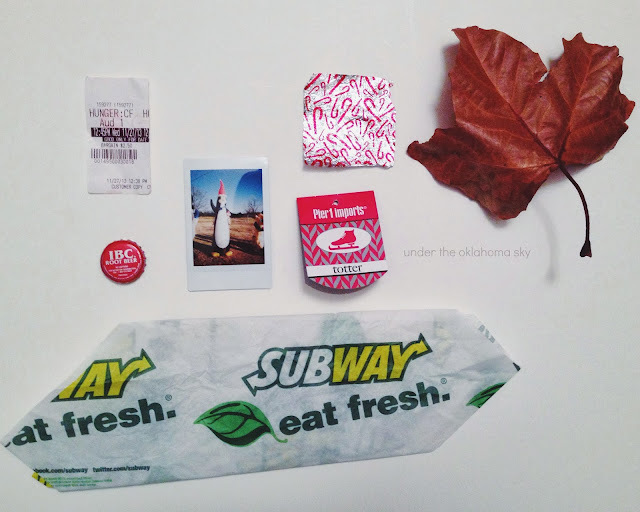 >> subway wrapper. i could eat at subway every single day. i recently tried their breakfast sammich, and OH MY. it's my current favorite. *this post is inspired by instagrammer @devincastro. i'm thinking of making this a monthly post of collected remnants from my daily life. twenty-thirteen: a year in review. explore: the first day of winter. two lessons every photographer should learn. explore // the first snow. the best homemade hot chocolate.